Although Nikola Tesla was never properly given credit for his works while he was alive, the impact he has had on today’s technologically driven society cannot be understated. He may in fact be more influential in this regard than any other single scientific thinker of the 20th century, as his pioneering works have laid the foundation for wireless communications, lasers, advanced propulsion systems, robotics, limitless free energy, and more, none of which were yet possible when he filed the patent for the first unmanned, remote operated vehicle, or drones as we now call them. In 1898, the visionary inventor filed a patent with the US Patent Office in New York City, #US000613809, entitled, Method Of And Apparatus For Controlling Mechanism Of Moving Vessels Or Vehicles. The invention would allow for self-propulsion of an unmanned vehicle for which he foresaw many potential uses, the most impressive of which, Tesla believed could bring peace to the world. 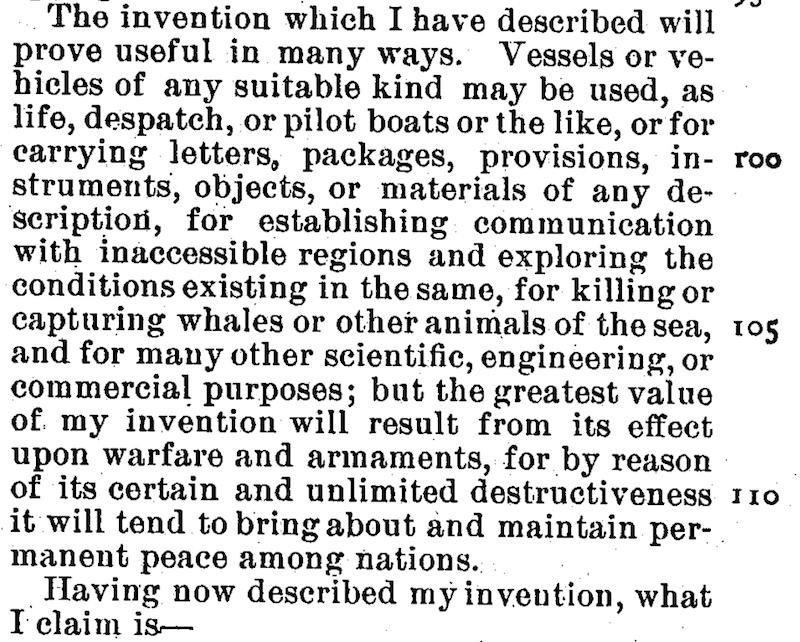 For at the time, Tesla apparently intuited the need for and a device so dangerous that it could promise mutually assured destruction between nations by virtue of it’s deadliness. 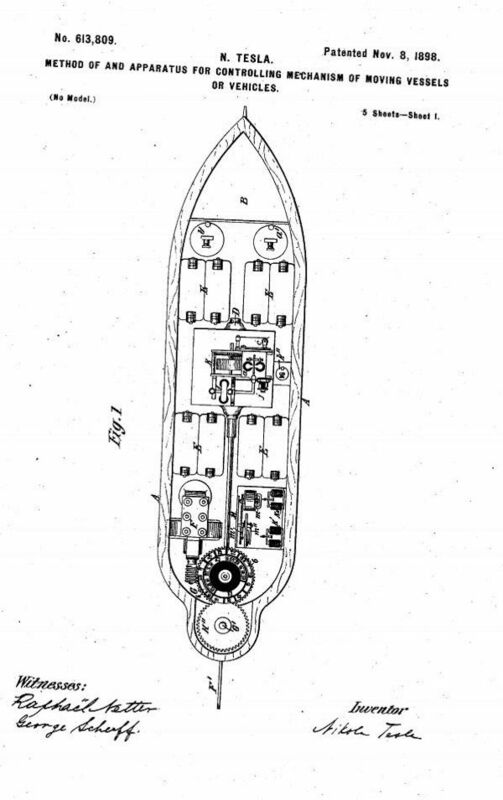 The patent contains schematics and design drawings for an seafaring vessel of which Tesla had envisioned as the first platform for remote-controlled technologies. The following drawing was captured from the website of the United States Patent and Trademark Office. Tesla explains what makes his device unique: the ability for it to be controlled by some type of wave transmitter that would enable the pilot to be located somewhere in range, but not on the vessel. Now a reality in the age of actual drone warfare, where military personnel can engage enemies while sitting on the other side of the planet. This prophetic device was so useful and so dangerous that Tesla believed it had the potential to create a permanent stalemate in global geo-politics by bringing about mutually assured destruction, or MAD, as it is popularly and more aptly known, a concept which was not actually realized until after the global proliferation of nuclear weapons began in the post-WWII cold war era. Again, his remarks foresee the need for a balance of power only possible under threat of mutual annihilation. How telling it is that a man of such otherworldly genius as Nikola Tesla could foresee that mankind’s survival would need to be hinged upon our ability to totally destroy each other and ourselves in the process? The doctrine of mutually assured destruction, did not, however, become recognized as national security policy until the Cold War. As it turns out when compared to the first half of the 20th century, humans have lived in relative peace and stability because of the concept of MAD, although it was not Tesla’s drones that promise opposing world powers mutually assured destruction, it is J. Robert Oppenheimer’s nuclear bomb.